당나라 현장(玄장)이 번역한 반야바라밀다심경에 대해 법장(法藏)이 해설을 단 주석서이다. 반야바라밀다심경은 줄여서 ‘반야심경’이라고도 부르는데, 여러 종파에서 공통적으로 읽고 외우는 보편적인 경전이다. 이 책은『반야바라밀다심경약소』에 송나라의 중희(仲希)가 자신이 지은『현정기』를 붙여 다시 편찬한 것으로,『반야심경소현정기』라 부르기도 한다. 목판에 새긴 후 닥종이에 찍어낸 것으로, 세로 31㎝, 가로 19.1㎝의 크기이다. 책머리에는 금강경의 전문(箋文:글의 뜻을 해명하거나 자기의 의견 등을 적어서 그 책에 붙이는 작은 쪽지)인 금강경심경전(金剛經心經箋)이 붙어 있다. 전문에 의하면 금강경은 조선 세조 10년(1464) 간경도감에서 간행하였음을 알 수 있다. 책 끝에는 조선 세조 10년(1464) 효령대군과 한계희 등이 왕명을 받아 간경도감에서 만들었다는 기록이 있다. 이 책은『반야바라밀다심경약소』(보물 제771호)와 같은 책이나 책 첫머리에 금강경의 전문이 붙어 있는 것이 다르다. 또한 보존 상태도 보다 양호하며, 교정을 하였다는 뜻으로 ‘교정인(校正印)’이라 쓰여진 도장이 찍혀 있는 점도 다르다. This book was a Buddhist scripture translated by Buddhist Monk Hyeonjang of the Tang Dynasty and annotated by Buddhist Monk Beopjang. Banya baramilda simgyeong is also called Banyasimgyeong (Heart Sutra) for short. It is a general scripture used by several sects of Buddhism for reading or reciting. 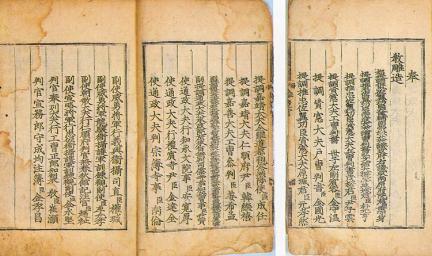 As a compiled version of Banya baramilda simgyeong yakso with Hyeonjeonggi written by Junghee of the Song Dynasty of China, the book is called Banya simgyeong sohyeonjeonggi as well. 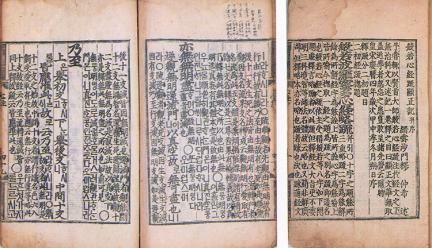 It was engraved on wood block and printed on mulberry paper, measuring 31 cm long and 19.1 cm wide. 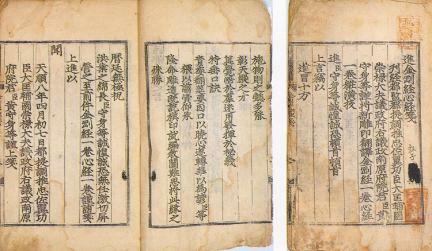 In the introduction are a short explanation and some opinions about Geumganggyeong (Diamond Sutra). According to the introduction, Geumganggyeong was published in the 10th year of the reign of King Sejo (1464) of the Joseon Dynasty by Gangyeongdogam (Directorate in charge of Buddhist publications in Korean language). 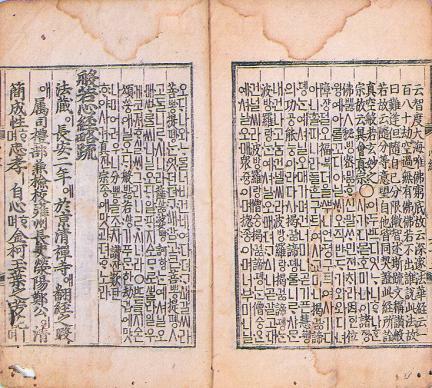 At the end of the book is a record indicating that Prince Hyoryeong and Han Gye-hui published the book in Gangyeongdogam at the King's order in the 10th year of the reign of King Sejo (1464) of Joseon. The book is the same book as the Commentary on the Prajnaparamita hridaya Sutra (Heart Sutra), Korean Translation (Treasure No. 771), but it has an introductory statement about Geumganggyeong in the beginning of the book. It has been relatively well-preserved, with a stamp indicating that the book was proofread.